I am in an Artist Way group that is taking a chapter a month in the book. I find it so interesting to go through it at this pace because I have really slowed down to examined more closely the practical application of the material in my life. I loved going through the book in 12 weeks because it is its own type of emersion experience, but this way slowing it down, I have been able to read the chapter a couple of different times and really hone in on the lessons to be learned. Chapter 3 is crucial in the process because it deals with anger and learning how to take back your sense of personal responsibility in your creative life. AND since we know that we are creative in EVERY aspect of our life, it is fundamental to making the life that you desire. The first couple months of Morning Pages can seem rather petty since you are becoming aware of the negative thoughts that you may be having on a regular basis. By slowing this process down, I remained in what I felt to be petty a good share of the time. I always used the end of the pages to write affirmations because I wanted to end my journaling on a positive note, but until I got to this chapter, I hadn’t really looked closely at where I was just handing over my personal power. I am always struck by the crazymaker section in chapter 2 (people in your life that bring drama and distract you from your craft), and I believe chapter 3 gives the antidote for this issue. The four main topics are anger, synchronicity, shame, and growth. When you realize that the crazymakers are truly a distraction that you use to avoid your own vulnerability (practicing your craft authentically/knowing & expressing yourself deeply), you can realize it is you who you’re really angry with, can be open to God’s goodness and abundant giving in your life through synchronicity, release shame and live in a space free of it, and be gentle with yourself as you go through the growing and shrinking of your own creativity. I had a major breakthrough this month with my more difficult relationships. I learned that God’s love is unlimited. I had misunderstood the source of my love for others to be coming from me. When we realize that love is coming from the same source of energy (God), it is possible to learn to tap into that unlimited source in every personal interaction. I think that in my own mind I felt that I could be used up and sucked dry. This is not a good space to live in. You end up feeling like people are there to take from you. It is a reason many people shut down who are more giving and loving by nature–they don’t feel that their need for a source of love is being filled and withdraw-the most extreme case in their social life. I learned that when you have people who seek a love source in you, you can simply tap into God’s love energy at that moment and since it was never really yours… you have lost nothing, but gained something very special. You are energized and both go away feeling uplifted and happy. People are more able to share their love with you as well. It’s amazing how much happier and energetic I have become. I believe this is a lesson connected with many of God’s gifts and blessings. We must get out of the way and realize that we are really a receptacle. It is our own selfishness and ego that causes us to stumble and withdraw from the creativity source.. the love source. 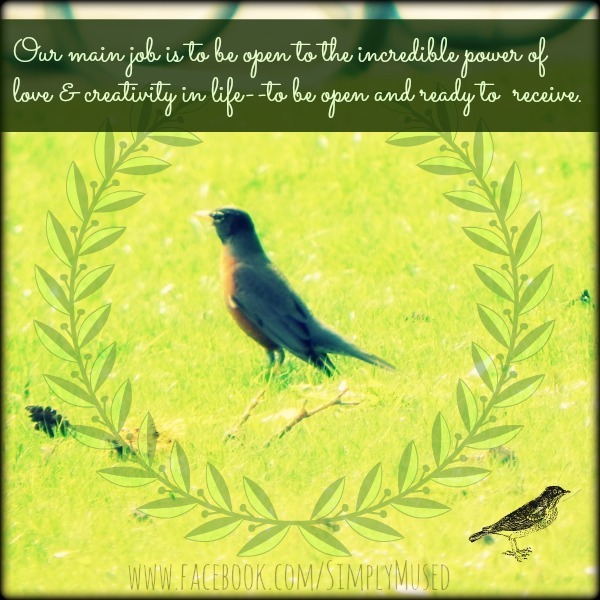 Our main job is to be open to the incredible power of love and creativity in our life–to be open and ready to receive. This entry was posted in Morning Pages and tagged creativity, energy, God, love, Morning Pages, The Artist's Way. Bookmark the permalink. ❤ I am so happy to hear that! We may be miles apart, in body, but we are close in heart in journey, my dear. The Artist’s Way is a resource I have used for years and you know my feelings about the morning pages! I don’t even want to guess where I would be without that “discipleship” … I say that because I do believe that books can be inspired and God’s messengers are all around. I have stacks of delicious writings that allow my anger, frustration and challenges to mingle beautifully with my trust, faith and love for life’s classrooms. This is a most welcome synchronicity … this post of yours. Thank you! Thank you for your thoughts Bernadettee. I am grateful to have found another soul as yourself to share in this process. The message of unlimited love came to me through synchronicity as well through a private session with Sarah at Alkimea. My whole month was just like that. I heard two interviews with Brene’ Brown and everything fit together in a neat little package of peace and understanding. I LOVE synchronicity! Ah, yes … those whispers and “Ah Ha” moments … like double rainbows! You have summed up this 3rd. Chapter so well. What really caught my spirit was how hearing about the unlimited source of LOVE coming through us, that it is never ending. Thank you so much for a very wonderful post, that I might share with the world if that is OK. Thank you Lisa! Please do share! ❤ The world needs to hear this for sure!